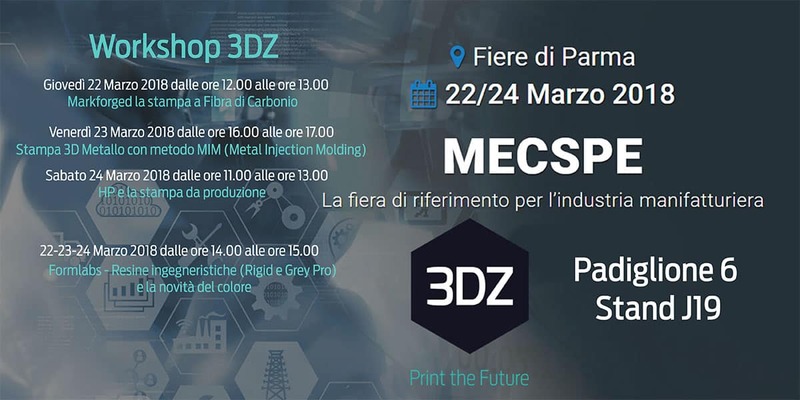 3DZ participates in MECSPE 2018, the reference exhibition for manufacturing industry. Since 17 editions, MECSPE is the largest event dedicated to innovations for the manufacturing industry. 3DZ, top reseller in Europe for HP, Markforged, 3D Systems, Formlabs, JCR, Artec, Materialise presents the latest 3D printing technologies at MECSPE. The solutions proposed are specific for manufacturing companies that wish to innovate their production and prototyping systems. At stand Pad. 6 Stand J19 different 3D printers and 3D scanners will be in operation, visitors will be able to touch the machines belonging to the different range of products. The 3D models produced and displayed at the stand will highlight the wide range of potential applications in the 3D printing sector used today in the Italian industry. It will be a great opportunity to discover with our experts how to include 3D printing in your workflow. Markforged is the young American company that has introduced an important innovation for the industrial sector, looking for solutions FDM (filament) with high mechanical resistance. Markforged products (a wide range from € 6400) are capable of extruding very high strength materials with continuous filament yarn in carbon fiber, glass fiber and Kevlar. The result is moulded parts that can be easily used in almost all production processes. During the workshop, application cases will be presented and you can see the numerous machines in operation in the stand at Pad 6, J19 of 3DZ. a “washing” is carried out in a cleaning station to remove the binder (binder that, together with the metal, creates the metal filament that is extruded) and then sinter everything in a dedicated oven. The furnace is the same as the MIM and here too there will be no problems that new technologies have at the beginning. During the workshop, application cases will be presented and you can see the machine in operation at the stand at Pad 6, J19 of 3DZ. Jet Fusion 3D is an HP printing solution for the production of high quality parts. In Italy it is already in use in many companies and during the workshop will be presented the main applications, some solutions for post-processing and the novelty of color, introduced by HP in mid 2018. Formlabs introduces new materials with high mechanical strength and color. The workshop will present the novelties directly from the parent company, with the possibility of printing pieces with Rigid and Grey Pro. Formlabs also allows you to print a wide range of colours in 3D without the need for manual finishing and painting. You can choose your own color and with a few manual actions the Form2 will print in the chosen color.